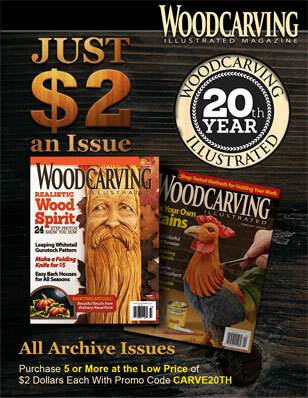 This article was first published in issue 37 of Woodworking Illustrated. Most carving tools that you buy today come “ready-sharpened,” and it comes as a surprise to students in my courses that the first thing we do is re-sharpen them! But surely, they ask, the manufacturers know what they are doing? Well, no. Manufacturers are not woodcarvers, but sellers of carving tools. And that sharp edge was probably honed in by a young man with no interest or experience in carving at all. By popular demand, manufacturers will give you something to get you going, but not necessarily what you need to be proficient as a carver. I’ll explain why shortly, but for now do realize that: “Sharp” is not the whole story. And you cannot assume that tool you bought is just as you need it for carving. I find an analogy useful: When you buy a guitar, it comes with strings, which the shop might have tuned sometime so customers can try out the instrument. Nobody, except perhaps a visionary teenager in their bedroom, would believe you could just start playing that guitar without checking and re-tuning, never mind carrying on for months without giving it a regular tweaking! In similar fashion, you purchase a gouge “with strings;” you still need to check it’s “in tune,” tune it if it isn’t, and keep it tuned. It’s as essential that you can sharpen your carving tools correctly as it is to tune your guitar. It is not difficult; far less skill is needed than for carving itself, but you do need to know what you are aiming for. A tool can be sharp (and you will have proved this easily enough as you reach for the Band Aid), but cutting badly! By badly, I mean doing a fraction of what it could do, being harder work than it need be, and hindering rather than helping control. 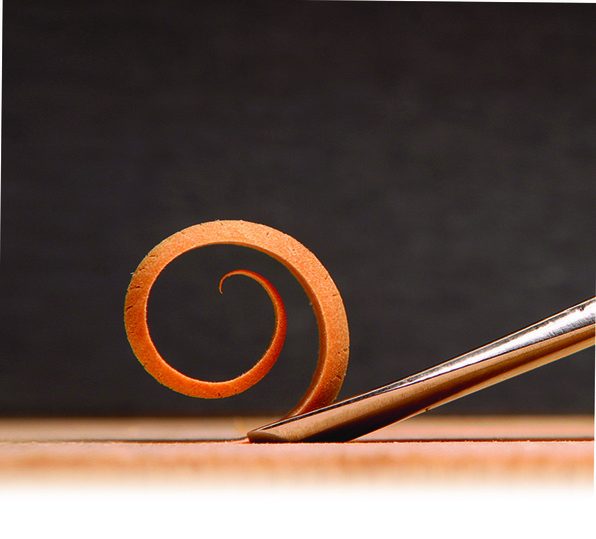 It’s all to do with the shape of the bevel, which is nothing more than a glorified wedge: even long-time carvers are amazed at the increased performance of their tools when they pay attention to getting this right. So sharpening means getting that sharp edge, sure, but something else: other qualities that give me the best from my tools. When I buy a new carving tool, I think of commissioning the carving tool—bringing it into service—rather than just sharpening it. This process includes sanding the handle smooth and checking the blade alignment. I have written extensively about sharpening carving tools in my book Woodcarving Tools, Materials and Equipment. Use that book to back up, extend, and understand the rationale behind these notes; I only have space here to boil it all down to basics. The various elements at the working end of a carver’s gouge. 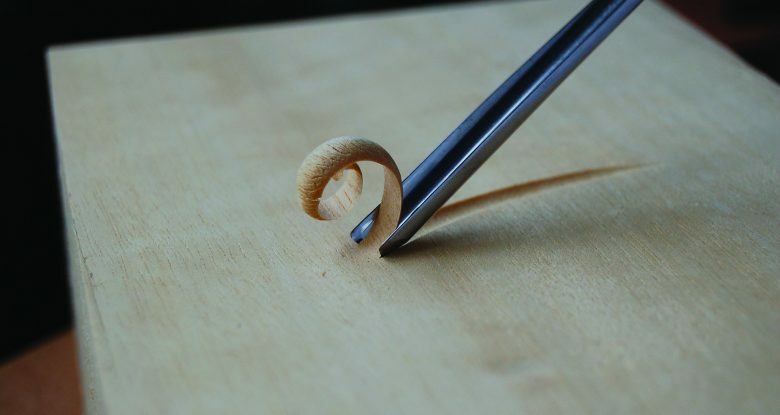 There are eight things to keep in mind—to aim for—when you are commissioning your carving tool: A keenly sharp, straight edge, at right angles to the blade, with the corners present. A flat, outside bevel at a cutting angle of 15-20° and with a softened heel. A shallower inside bevel of 5-10°. 1. Corners: Keep these (if only because you’ve paid for them!). Each is like the point of a knife, and you will use them in a somewhat similar manner. 2. Straight line from corner to corner: The edge shouldn’t be wavy, stick out in the middle (nose), or protrude at the corners (winged). 3. Edge at right angles to the blade: The exception is the skew chisel, of course. 4. Sharp! : The tool should leave a polished facet without scratches; it produces a cut you can leave as a finished surface. 5. 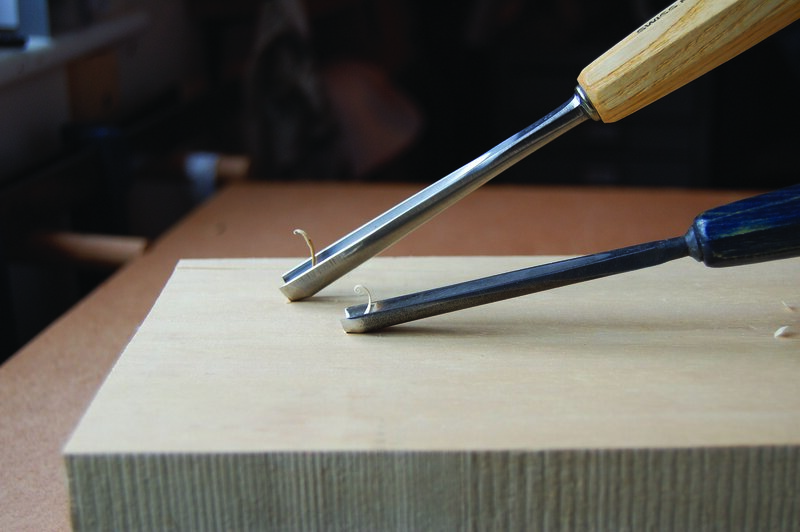 A cutting angle of 15-20°: The angle at which the tool cuts the wood. I’ll explain the significance and how to find this cutting angle below. 6. Flat: From heel to edge, it should not be rounded or hollow, and should have no secondary (micro) bevel. 7. Softened heel: The cutting edge scoops through the wood by rocking on the heel. Slightly rounding the heel prevents scratches and eases the cut. 8. Short: 5-10°: The inside bevel can be slightly rounded and merge with the blade. Place your gouge hollow upwards on a clean flat piece of wood. Slowly move the gouge forward while raising the handle. When the cutting edge nicks the wood, this is the cutting angle, the angle at which it cuts. The cutting angle is decided by the condition of the bevel as it rubs the wood and offers the cutting edge to the fibers. As the angle gets higher, so the handle rises, and the control you have over the carving tool lessens: your efforts are less directed along the blade and more into pivoting the handle forwards. Also, a larger angle means a bigger wedge of metal to push into the wood. An angle of around 15-20° with an inner bevel gives a good wedge shape for the majority of carving woods. I’ve seen students battling with the 45° bevel that a manufacturer put on their tool! For greatest control, the cutting angle should be as low as possible. Periodically check the cutting angles of all your carving tools. Honing wheels and regular stropping can increase the angle by rounding the bevel without you noticing. At the back, a new Pfeil tool with an excessively high cutting angle. A lot of your effort in pushing this gouge along will be towards tilting the handle forwards. Your energy in pushing the other gouge goes more directly through the blade with greater efficiency and more tool control. 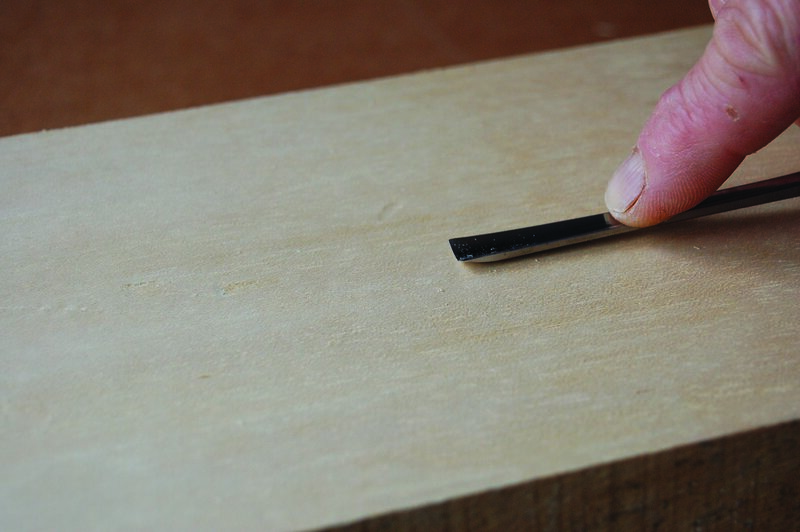 The inside bevel alters the feel and performance of a carving tool to great advantage. The best way to convince yourself is to carve with two similar gouges, one with and one without the inside bevel, and compare. So, with an inside bevel: You can far more easily cut with the gouge upside down. Without the bevel, the cutting edge tends to jig and bury itself into the wood, rather than rising out by pivoting on the heel of the inner bevel. The inside bevel strengthens the edge by increasing the overall bevel angle. This allows a lower cutting angle since the outer bevel can be longer. An inner bevel eases the shaving up and out of the deep channel between the metal walls. Thus there is a very special configuration in a carving gouge. A cross section through a carving gouge. Make the angle for the inner bevel quite low, 5-10°. Add the inner bevel early on in the commissioning of a carving tool, before dealing with the outer bevel. The flatter the gouge (ie. the lower the number) and the more it will be used upside down, the longer the inner bevel. So, V-tools, bent gouges, and U-shaped gouges need very little, if any. Be brave. I’ve seen the length of inner bevels up to 1/4 that of the outer. 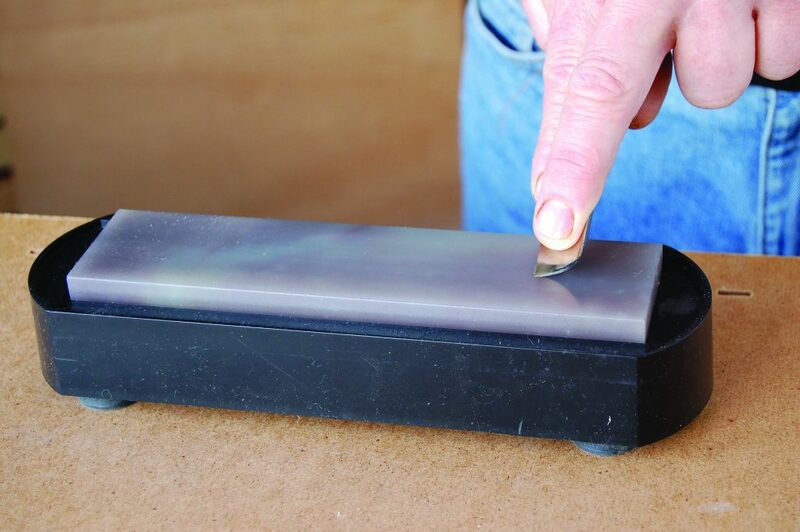 Any inside bevel will help you use the tool upside down—experiment and try increasing it! 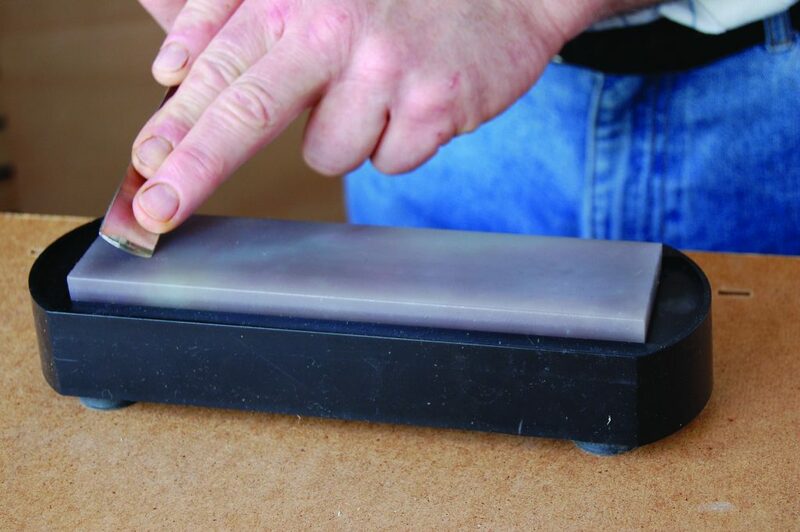 There is no moral high ground in sharpening with bench and slipstones, rather than honing wheels, although I do think the slower and surer method is the best for beginners to start with. Power wheels are fast and can give you an unwanted shape before you know it. I feel they are best introduced to speed up the commissioning process when you know exactly what you are doing. Reflecting light off the emerging cutting edge will tell you how and where it is thinning—when sharp, this line is invisible. 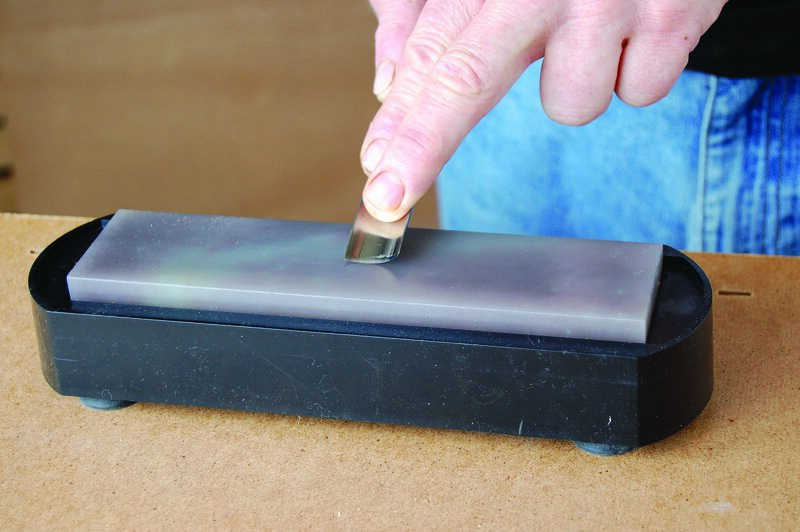 Different types and positions of scratches on the bevel will tell you exactly how you are presenting the bevel to the stone. White line: You’ll see this by looking at the very end of the gouge for reflected light, as if you are checking the sweep. As the tool gets sharper, so this line thins. 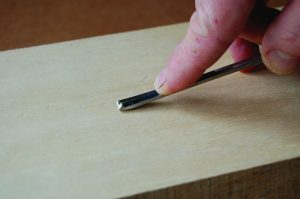 The knack is to reduce the white line gradually and evenly while keeping the bevel flat and at the correct cutting angle. Bevel scratches: Different types of stones or wheels have individual cutting properties and abrade or scratch the bevel metal in different ways. You can look at these scratches and see how you have been presenting the gouge. Concentrate on setting the outside (and inside) bevels correctly, and as you finish you will find the sharpness of the cutting edge will take care of itself. 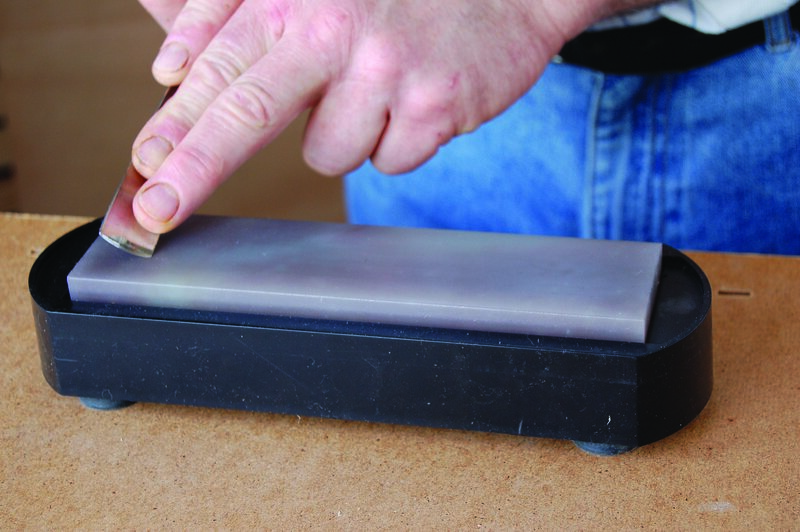 Shaping: Use coarse bench and slipstones for rapid metal removal. Stop when the white line is an even hair’s breadth. Square and straighten the cutting edge (you can polish it on a fine stone to see it better) corner to corner. Set the inside bevel. Set the outside bevel. The best advice I can give you here is to present the blade to the stone at the cutting angle—pretending you were cutting a piece of wood. 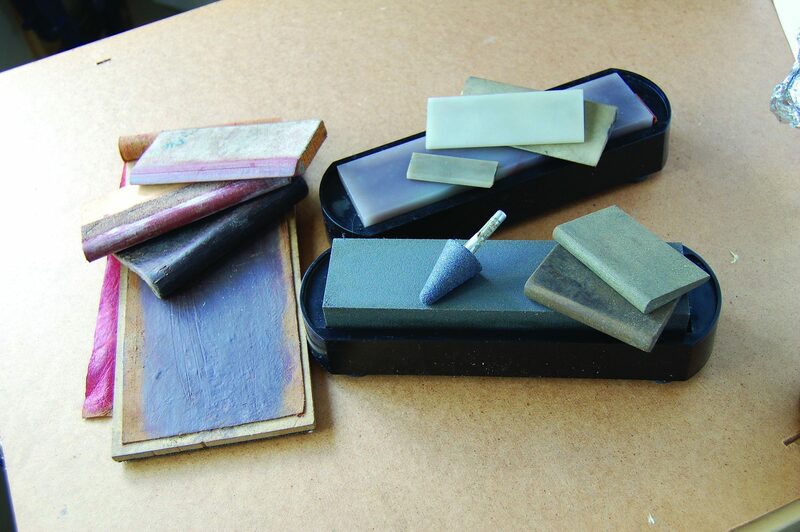 Hand sharpening uses coarse and fine benchstones and slipstones such as these. 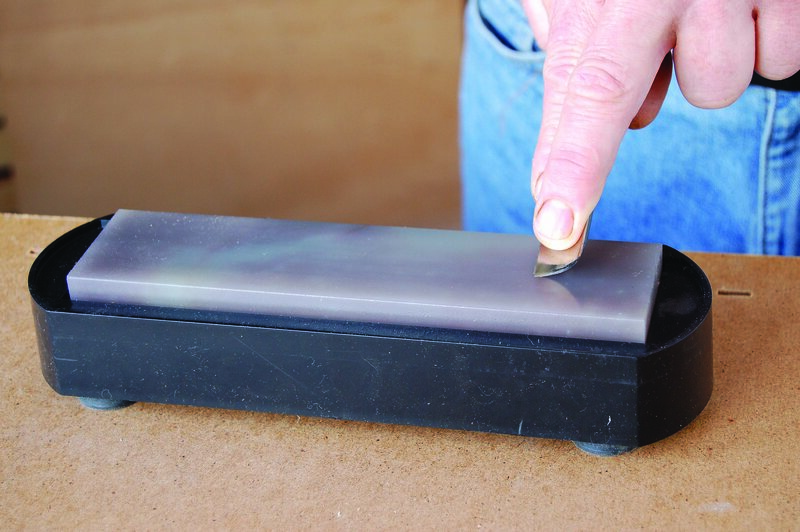 Use a strop to keep the edge keen. I use the little wheel in the center of the picture for forming the inside bevel of larger tools. Finishing: Use fine bench or slipstones to reduce the white line evenly until it disappears. Check the cutting angle and keenness of the edge in a piece of scrap wood—ideally an offcut of the timber you will be carving. For shaping my carving tools, I use a simple grinder and a coarse Norton India benchstone for the outside, and coarse slipstones for the inside. To finish to a final sharp edge, I switch to a translucent Arkansas benchstone and slipstone, going back and forth between the two as the white line attenuates (becomes thin) and disappears. Benchstones are presented side on for gouges. The tool moves from one end to the other with the bevel offered at the cutting angle, and rotated so that its whole width of the bevel is covered. Present the gouge to the benchstone at the cutting angle and towards one end, turned to face inwards. As you move along the stone, rotate the blade. Come to a stop at the opposite end having rubbed the whole bevel, corner to corner. Return by reversing the rotation. Slipstones are rubbed back and forth around the whole of the inner bevel at a tight 5-10° angle. 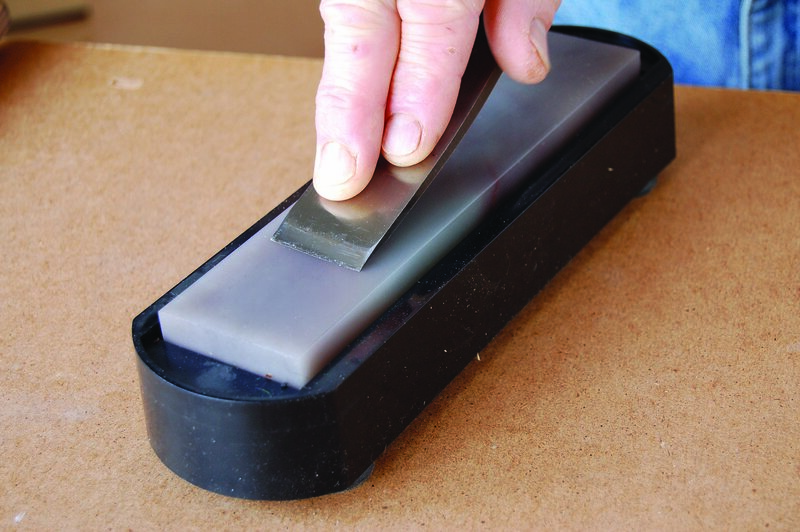 Rub a suitable slipstone to shape and finish the inside bevel. If you are using power honing wheels, keep checking the cutting angles in a piece of waste wood. Power honing wheels tend to round the bevel and thus raise it. For the outer bevel you should use as hard a wheel as possible. 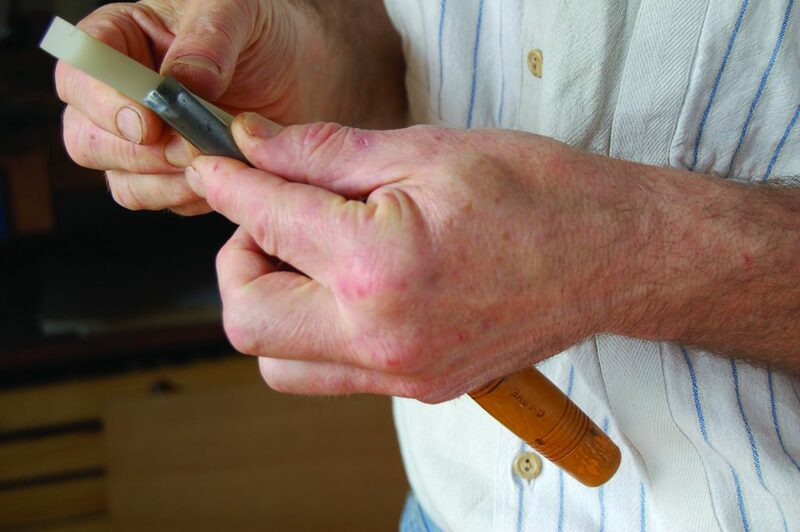 Maintaining the edge: if you are not using a honing wheel, then you will need a flat, hard leather strop with a proprietary abrasive dressing for the outside and folded, thick, dressed leather for the inside. Let me repeat: Periodically check the cutting angles of all your carving tools. 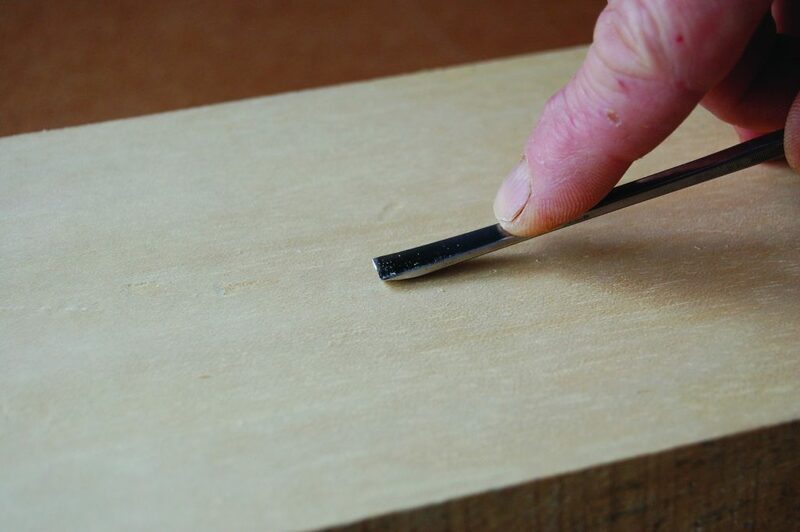 Honing wheels and regular stropping can round the bevel without you noticing, increasing the angle. You then need to flatten the outer bevel to recover the correct cutting angle. 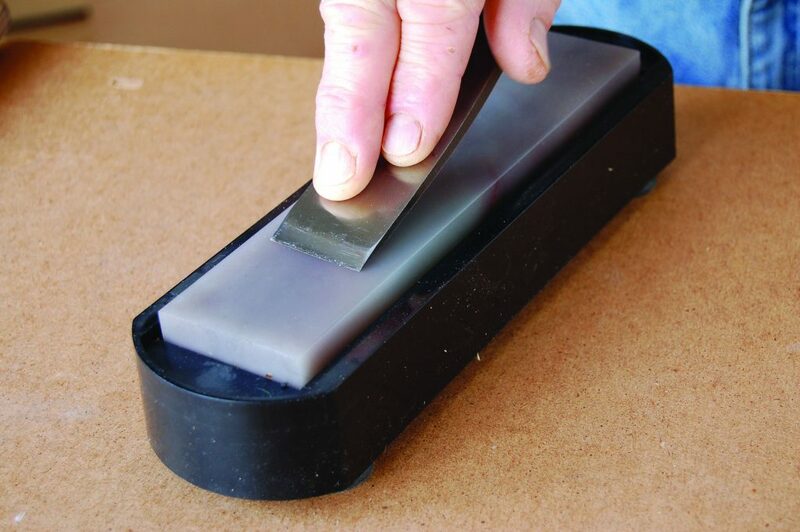 Sharpen chisels along the length of the stone. Carving chisels are sharpened with the same 15-20° cutting angle in similar manner to a carpentry chisel. There is a bevel on both sides for reasons that should be clear from the earlier demonstration. Skew chisels are sharpened similarly, but with the end around 45°. They also have a bevel on both sides. V-tools can cause particular problems. 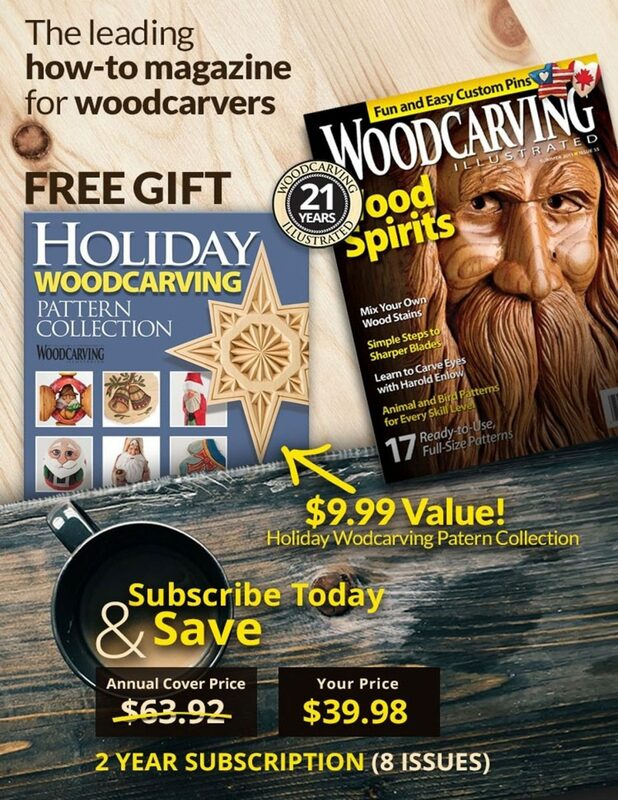 Besides the information in my Woodcarving Tools, Materials and Equipment book, I have made available a step-by-step guide on my website. Called ‘Selecting and Sharpening your V-tool,’ you may download it freely for a contribution to charity. 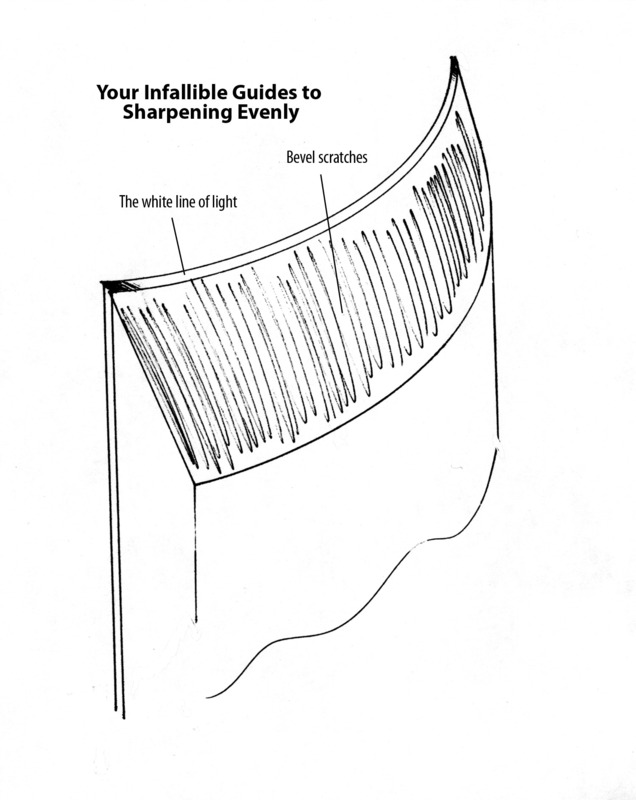 I have only given you a summary of vital points in sharpening your carving tools. I hope you see how merely “sharp” for a carver is not actually good enough. I’ve put the most emphasis on the cutting angle and inside bevel on your tools. This is how I was taught, and I have not improved on it over the years. I use the same methods today.